A man has been stabbed to death outside a London Underground station. 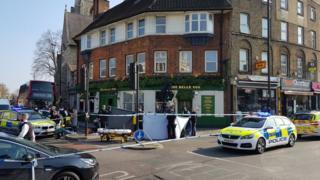 The victim, in his 40s, was found wounded on Clapham Park Road, near Clapham Common Tube station in south-west London, after police were called just after 14:30 GMT. Despite the efforts of paramedics the man died at the scene. His next-of-kin have not yet been informed. A crime scene is in place and some roads are closed, but the station remains open. No-one has been arrested. The Metropolitan Police has granted itself stop and search powers for the area throughout Friday night. Supt Sean Oxley, of the Met, said: "Our thoughts are with the victim and his family." Lambeth Council said in a tweet that people should avoid the area and it was "saddened" by the "traumatic" incident.